In order to maximize the benefits of your weaning and preconditioning your calves, we will designate a portion of the first sale of each month to feature weaned calves. 1. Weaned at least 45 days. 2. Delivered to DLM prior to 5 p.m. on the Saturday preceding the 1st sale of each month (ie, December 1 for the December 3 sale). 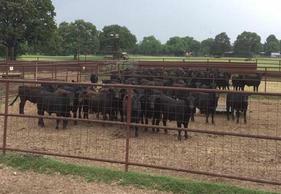 Cattle will be sold first in – first out. Any vaccination program you follow will be announced as your cattle are presented (Buyers recommend vaccinations against respiratory disease.). Whether you have 1 calf or 100, if they meet the minimum requirements they can be included in this featured segment of the sale – the more cattle offered the greater the buyers’ interest. To meet the requirements for this sale, calves must be weaned (separated from their mamas) for a minimum of 45 days and arrive the Saturday before the sale. We do not require any certain vaccinations but do have a certification card for you to fill out and sign upon arrival with the information about their weaning date as well as any vaccinations you have given. This form is also available below.